With over 100 dive sites to choose from in the Marbella and Puerto Banus area of the Costa del Sol, scuba divers of all experience levels and persuasions can be guaranteed a week or more’s variety of diving. From deep offshore reefs – home to large pelagic species – to wrecks and caves closer to shore, if you’re a metalhead, a deep freak or just prefer to spend your holiday dive gliding gently around colourful reefs, the dive sites are just a mouse click or email away. Dolphins often like to accompany us to the dive site and we always have to be on the lookout for turtles. 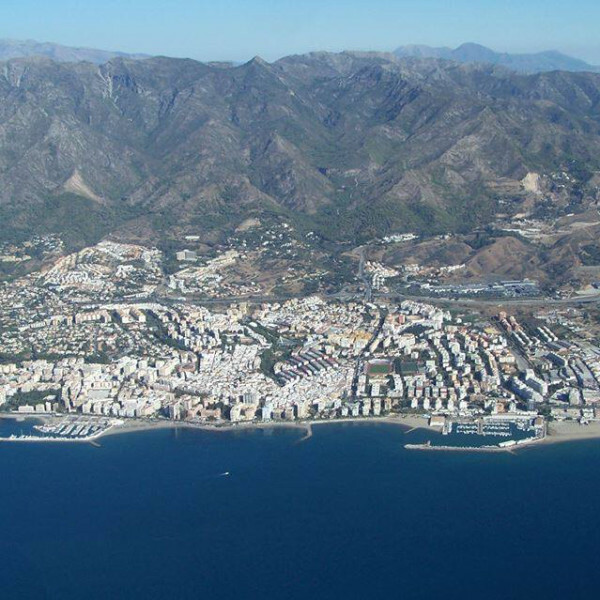 All dive trips depart from our dive centre located in Marbella Port (Puerto Deportivo de Marbella), yards from the beach, next door to some of the most popular bars and overlooking the water where our RIB boat awaits. We offer up to three dive trips a day, all two tanks. Sign up for our boat diving in Marbella now! Includes two guided dives, full equipment rental, transportation to and from the dive site by RIB boat, plus light refreshments (bottled water, fruit juice, cookies and après-dive beers). The Tower (6-16m) Just 5 minutes’ boat ride from our base in Marbella Port, this famous Marbella landmark is the last remaining crane tower of several that were constructed in the 1950s and used for around 20 years for transporting minerals from a quarry in the surrounding mountains to waiting cargo vessels. What remains is an artificial reef made of three wrecks and other substantial wreck parts, steel structures and crane arms that host many Mediterranean marine life such as blennies, octopus, cuttlefish, squat lobsters, moray and conger eels, as well as sponges, soft corals and nudibranchs. Another permanent feature is the statue of the “Queen of the Seas” herself, the Virgen del Carmen, protected from the tide by a large piece of shipwreck. El Pimpollo (14-18m) This site, a few nautical miles south of Marbella’s famous Golden Mile and in sight of Puerto Banus, is formed of a large horseshoe-shaped reef with small caves at the North end and several overhangs elsewhere. There is very little current at this site but plenty of fantastic marine life. Boloñes de Banus (14-25m) A vast area of boulders makes this rocky reef the ideal safehouse for countless octopus. A great spot for a drift dive for Open Water and more experienced divers alike. Roqueillos (25-35m) A 2km stretch of rocky offshore reef that is enveloped in bright, colourful soft coral and is home to schools of pink Anthias, shoals so thick it feels like gliding through fish soup! Because of its location and protection from fishing boats, expect to see plenty of Conger eels, large Spider crabs and Spiny lobster. Due to the depths and occasional currents here, divers must be at least PADI Advanced certified and have some experience in drift diving. Las Bovedas (18m-40m+) One of the top 10 dive sites in Spain, Placer de las Bovedas is a large, 2kmsq reef populated by an incredible variety of marine species, from groupers, wrasses and breams to octopuses, nudibranchs, damselfish, scorpion fish, congers, morays, sponges, corals and many others. Three nautical miles from the coast and a 20-minute RIB ride from our Marbella base, the reef walls, canyons and valleys can be exposed to strong currents with the shallowest pinnacle in 18 metres and the steep drop off on the other side plummeting to 100m and beyond. Being close to the Gibraltar Straits and its inflow of currents from the open Atlantic Ocean, you are likely to see marine species here that you won’t encounter anywhere else in the Med. Demanding drift and deep dives can be the norm. La Laja del Almirante (21-24m) This gigantic area – the size of 3,000 rugby fields – is considered to be one of the most important marine sites, not only of the Malaga coastline but of the entire Mediterranean due to its enormous biodiversity in which over 500 species coexist. The site of many scientific studies, the area has been declared an EU “SCI” (Site of Community Importance). Also known as Laja de las Gorgonias for the abundance of soft corals found here, this dive is typically a drift dive. Large rock formations are found in the form of a continuous curving wall that can sometimes appear to go on for eternity! Along the entire route’s overhanging reef, big marine species such as groupers, congers and lobsters can be found. The Galleon (7m) The charred remains of a 300 year old French galleon, now a favourite nesting place for cuttlefish and also home to octopus and conger eels. The Battle of Marbella was a naval battle that took place while a combined Spanish-French force besieged Gibraltar on 10 March 1705 during the War of Spanish Succession. The Lys warship was driven ashore by the allied convoy of English and Dutch. She was set alight by her crew to avoid capture. Belt buckles and buttons, as well as cannon balls can still be found, making this is a great dive for history buffs and young divers. I have never seen so many octopus and nudibranchs in dives before, I think one diver actually counted over 12 octopuses in one dive! There was such a wealth of sea creatures and we took some amazing photos.